Music is a great way to liven up your presentations and keep your audience engaged. Unlike Microsoft PowerPoint, however, Google Sheets doesn’t include support for audio files. But with the following workarounds, you can add a soundtrack to any slide for a more dramatic deck. 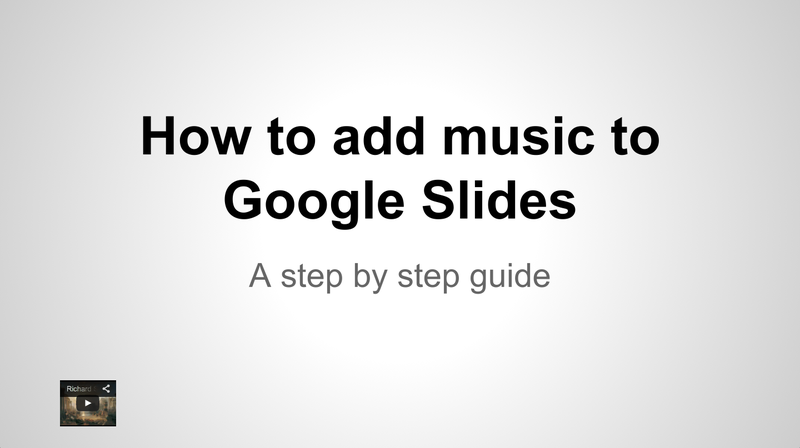 The easiest way to add music to your Google Slides presentation is to link to a track from an online music service like Spotify, Soundcloud, or Grooveshark. 1. Open a Google Slides presentation in your web browser and go the slide to which you want to add music. 2. Select Insert > Text box from the menu or click the text box button in the toolbar. Click anywhere on the slide to automatically create a text box. 3. Go to your favorite online music service, find the track you want to use in your presentation, and follow the service’s instructions to copy the link. 4. Return to your slide and paste the track link into the text box you just created. 5. Click the arrow tool and resize the text box and move it to wherever you want it on the slide. 6. To play your presentation, select View > Present from the menu. With the presentation in view, click the link to trigger the music. The file will open in separate browser tab and play until you close it. Integrate a music link into your slide design with a photo or some clip art. If you feel the raw text link is an eyesore on your otherwise beautiful slide deck, you can cover it with an image to better integrate it with your design. 1. From the menu, select Insert > Image. Search for a photograph or clip art. Click on the image you want and hit Select to add it to your slide. 2. Select the arrow tool. Resize the image and move it where you want it on the slide. 3. With the image selected, click the “insert link” icon from the tool bar. Paste the track link in the box that appears, and click Apply. 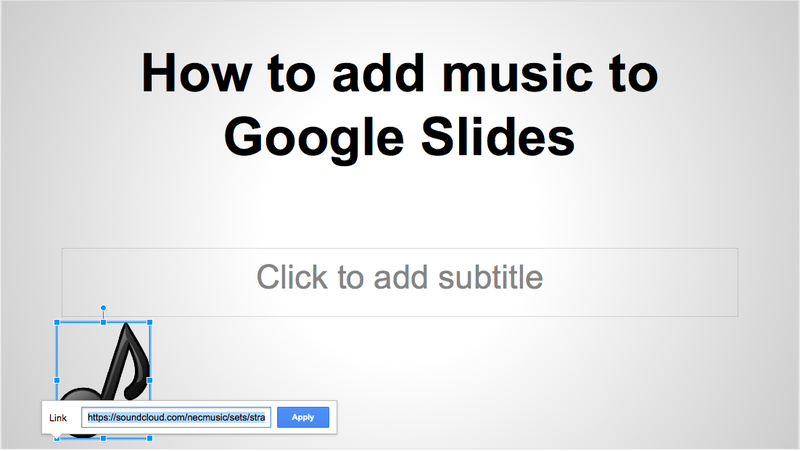 Now when you play your presentation, trigger the music by clicking this image. The other way to add music to your presentation is with a YouTube video. There are two ways to do this. The first is to follow the steps above and just copy the video link and paste it in a text box. The second way is to insert the actual video on your slide. This method is best when you want to use a shorter music clip to introduce an idea or underscore a point, because the video will stop playing when you advance the slide. You can search YouTube from within Google Slides by using the "insert video" command. 1. From the slide on which you want to add music, select Insert > Video from the menu. 2. 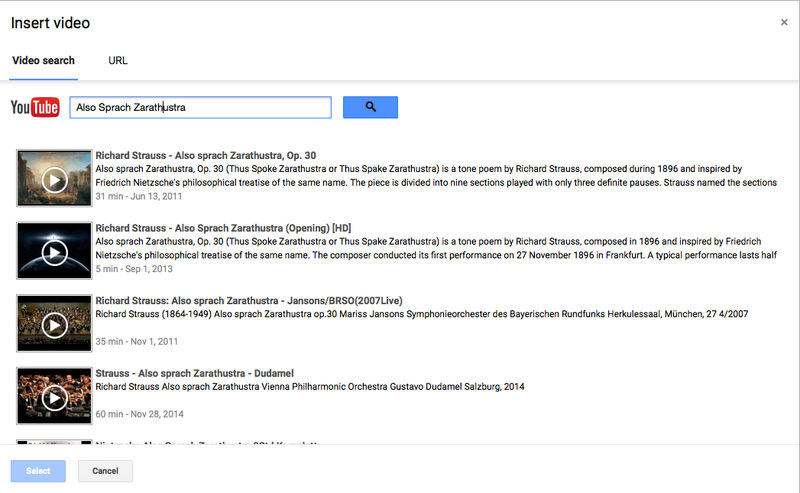 Type your query in the YouTube search field that pops up. 3. Click the video with the music you want, and hit Select to place it on the slide. 4. Click the arrow tool and resize the video to its smallest size, and position it where you want it on the slide. When you use a YouTube video for your music track, resize it to make it unobtrusive. When you show this slide during your presentation, click the miniaturized video to play the music.